Rebecca Gordon told Dr. Oz that Virgo, the sign for people born between August 23 and September 22, is ruled by the belly. Astrologers believe the state of your belly is a metaphor for how you digest reality. 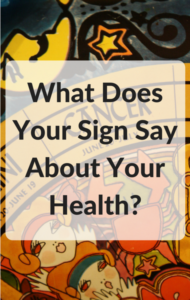 Digestion issues are the most common health problem among Virgos. Libra rules the lower back and is the sign of those born between September 23 and October 22. Libras tend to give too much to others, often not focusing enough on themselves and their own lives, resulting in a sore back. It is the body’s metaphor for not being able to stand up straight and focus on self care. Rebecca Gordon told Doctor Oz that Scorpio rules the sacral center and is the sign of rebirth of a generation. Those born between October 23 and November 21 and Scorpios. Astrologers believe Scorpios are more at risk of holding on to past relationships or experiences and that refusal to move forward can lead to reproductive problems.